Our focus is on safety and crisis stabilization; adolescents generally come here when they are struggling or experiencing a crisis at home, in the community, or at school, and are dangerous to themselves or others. Many have exhibited behavioral problems, such as aggression or substance use. While in our care, adolescents quickly come to understand that they are in a safe, warm, welcoming environment, and are encouraged to talk about any problems and behaviors that are troubling them. Our milieu offers peace of mind for parents, too – the unit is highly monitored 24 hours a day. 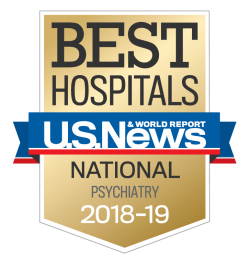 We treat adolescents with a variety of behavioral challenges and diagnoses on our unit; many have attention deficit hyperactivity disorder (ADHD), depression, anxiety, bipolar disorder, personality disorders, and/or psychosis. During each adolescent’s stay, we focus on crisis stabilization so that the adolescent can move back into their home community as quickly as is safely possible. The average length of stay on the Adolescent Unit is 10 days.